Posted on February 4, 2013 at 6:24 pm. UPDATED Feb. 6, 2019. From the year 2019, Medicare Advantage Disenrollment Period (MADP) has been replaced by Medicare Advantage Open Enrollment Period (MA OEP). 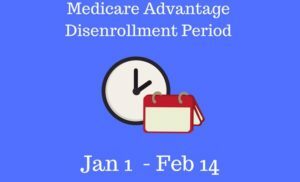 If you are dissatisfied with your Medicare Advantage plan, you may disenroll from it starting on the 1st of January during the Medicare Advantage Disenrollment Period (MADP). You may also consider enrolling in the Medicare Supplement plan (Medigap plan). The Medicare Advantage Disenrollment Period (MADP), which runs annually from the 1st of January through the 14th of February, allows you only to disenroll from the Medicare Advantage Plan. If you’re in a Medicare Advantage plan, you can leave your plan and switch to Original Medicare. Your Medicare Advantage plan may or may not include Part D drug coverage (MA or MAPD, correspondingly). The effective date of disenrollment is the first of the month following the acceptance of the disenrollment request. Regardless of whether you have MA or MAPD, if you switch to Original Medicare during this period, you will go through a Special Enrollment Period (SEP) to enroll in the standalone Medicare Prescription Drug plan (PDP). You may enroll in PDP at any time during MADP. Your coverage will begin the first day of the month after your enrollment form is received. If you have the Medicare Advantage plan that includes Part D coverage (MAPD), just enroll in the PDP plan of your choice. You will automatically be disenrolled from your old Medicare Advantage plan. Join, switch, or drop a Medicare Medical Savings Account Plan (MSA). What do you think about Medicare Advantage Disenrollment Period (MADP)? Write your comments.